At Valley End Infant School, we believe that Art and Design contributes to many areas of the school curriculum by encouraging children to be independent, think creatively, generate ideas and find their own solutions for a given task. It often involves working in pairs or small groups thus developing team work and pride in tasks achieved together.We aim to develop knowledge, understanding and an enjoyment of Art and Design. The planned curriculum for Art and Design at Valley End is structured with a focus on the progression of skills across the year groups. We aim to teach and develop specific skills in drawing, painting, print making, textiles and three dimensional work. 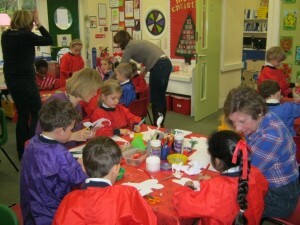 The children will be taught to plan, make and evaluate their work. 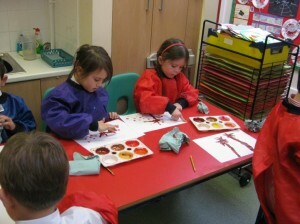 They will learn to select and use a range of appropriate tools safely. The staff strives to promote a happy and stimulating environment in which children are able to understand the true value of their achievements and those of their peers.